Tel Aviv (Hebrew: תֵּל אָבִיב-יָפוֹ‎, [tel a'viv yafo], Arabic: تل أَبيب-يافا‎‎) is a major city in Israel, located on the country's Mediterranean coastline. It is the financial center and the technology hub of Israel, with a population of 432,892, making it Israel's second-largest city. Tel Aviv is the largest city in the Gush Dan region of Israel. Tel Aviv is also a focal point in the high-tech concentration known as the Silicon Wadi. Tel Aviv is governed by the Tel Aviv-Yafo Municipality, headed by Ron Huldai, and is home to many foreign embassies. Tel Aviv is a global city and is the 32nd most important financial center in the world. Tel Aviv is known to have the third-largest economy of any city in the Middle East after Abu Dhabi and Kuwait City. The city has the 31st highest cost of living in the world. Known as "The City that Never Sleeps," Tel Aviv receives over a million international visitors annually. A "party capital" in the Middle East, it has a lively nightlife and 24-hour culture. The city was founded in 1909 by Jews on the outskirts of the ancient port city of Jaffa (Hebrew: יָפוֹ‎ Yafo). Its name means Spring Hill, though the hill was mostly sand. 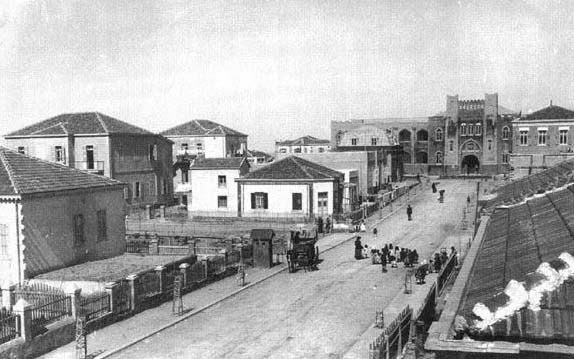 The modern city's first neighborhoods had already been established in 1886, the first of which was Neve Tzedek. Tel Aviv and the Jews of the Palestine region suffered a massive setback under the Ottomans who expelled around 16,000 Jews to Egypt, known at the Tel Aviv expulsion. Immigration by mostly Jewish refugees meant that the growth of Tel Aviv soon outpaced that of Jaffa, which had a majority Arab population at the time. Tel Aviv and Jaffa were later merged into a single municipality in 1950, two years after the establishment of the State of Israel. Tel Aviv's White City, designated a UNESCO World Heritage Site in 2003, comprises the world's largest concentration of International Style buildings (Bauhaus and other related modernist architectural styles). Tel Aviv is the Hebrew title of Theodor Herzl's Altneuland ("Old New Land"), translated from German by Nahum Sokolow. Sokolow had adopted the name of a Mesopotamian site near the city of Babylon mentioned in Ezekiel: "Then I came to them of the captivity at Tel Abib, that lived by the river Chebar, and to where they lived; and I sat there overwhelmed among them seven days." The name was chosen in 1910 from several suggestions, including "Herzliya". It was found fitting as it embraced the idea of a renaissance in the ancient Jewish homeland. Aviv is Hebrew for "spring", symbolizing renewal, and tel is a man-made mound accumulating layers of civilization built one over the other and symbolizing the ancient. Since 1886, Jewish settlers had founded new neighborhoods outside Jaffa on the current territory of Tel Aviv. The first was Neve Tzedek, built on lands owned by Aharon Chelouche and inhabited primarily by Mizrahi Jews. Other neighborhoods were Neve Shalom (1890), Yafa Nof (1896), Achva (1899), Ohel Moshe (1904), Kerem HaTeimanim (1906), and others. Once Tel Aviv received city status in the 1920s, those neighborhoods joined the newly formed municipality, now becoming separated from Jaffa. 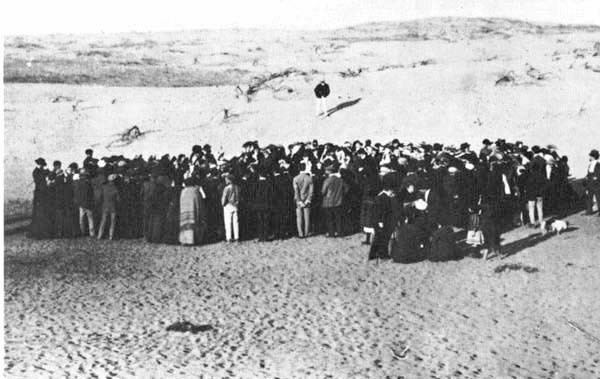 On 11 April 1909, 66 Jewish families gathered on a desolate sand dune to parcel out the land by lottery using seashells. This gathering is considered the official date of the establishment of Tel Aviv. The lottery was organised by Akiva Aryeh Weiss, president of the building society. Weiss collected 120 sea shells on the beach, half of them white and half of them grey. The members' names were written on the white shells and the plot numbers on the grey shells. A boy drew names from one box of shells and a girl drew plot numbers from the second box. A photographer, Avraham Soskin, documented the event. The first water well was later dug at this site (today Rothschild Boulevard, across from Dizengoff House). Within a year, Herzl, Ahad Ha'am, Yehuda Halevi, Lilienblum, and Rothschild streets were built; a water system was installed; and 66 houses (including some on six subdivided plots) were completed. At the end of Herzl Street, a plot was allocated for a new building for the Herzliya Hebrew High School, founded in Jaffa in 1906. On 21 May 1910, the name Tel Aviv was adopted. The flag and city arms of Tel Aviv (see above) contain under the red Star of David 2 words from the biblical book of Jeremiah: "I (God) will build You up again and you will be rebuilt." (Jer 31:4) Tel Aviv was planned as an independent Hebrew city with wide streets and boulevards, running water at each house, and street lights. When Israel declared Independence on 14 May 1948, the population of Tel Aviv was over 200,000. Tel Aviv was the temporary government center of the State of Israel until the government moved to Jerusalem in December 1949. Due to the international dispute over the status of Jerusalem, most embassies remained in or near Tel Aviv. In the early 1980s, 13 embassies in Jerusalem moved to Tel Aviv as part of the UN's measures responding to Israel's 1980 Jerusalem Law. Today, all national embassies are in Tel Aviv or environs. The city is located 60 kilometers (37 mi) northwest of Jerusalem and 90 kilometers (56 mi) south of the city of Haifa. Neighboring cities and towns include Herzliya to the north, Ramat HaSharon to the northeast, Petah Tikva, Bnei Brak, Ramat Gan and Giv'atayim to the east, Holon to the southeast, and Bat Yam to the south. The city is economically stratified between the north and south. Southern Tel Aviv is considered less affluent than Northern Tel Aviv with the exception of Neve Tzedek and some recent development on Jaffa beach. Central Tel Aviv is home to Azrieli Center and the important financial and commerce district along Ayalon Highway. The northern side of Tel Aviv is home to Tel Aviv University, Hayarkon Park, and upscale residential neighborhoods such as Ramat Aviv and Afeka. Tel Aviv has a Mediterranean climate (Köppen climate classification: Csa), characterised by hot, humid yet rainless summers and mild, wet winters with most of the annual precipitation falling between October and May. The average annual temperature is 20.9 °C (69.6 °F), and the average sea temperature is 18–20 °C (64–68 °F) during the winter, and 24–29 °C (75–84 °F) during the summer. The city averages 528 millimeters (20.8 in) of precipitation annually. Summers in Tel Aviv last about five months, from June to October. Precipitation during the summer is rare, although light drizzles may occur in some early mornings. August, the warmest month, averages a high of 30.6 °C (87.1 °F), and a low of 25 °C (77 °F). The high relative humidity due to the location of the city by the Mediterranean Sea, in a combination with the high temperatures, creates a thermal discomfort during the summer. Summer low temperatures in Tel Aviv seldom drop below 20 °C (68 °F). Winters are mild and wet, with most of the annual precipitation falling within the months of December, January and February as intense rainfall and thunderstorms. In January, the coolest month, the average maximum temperature is 17.6 °C (63.7 °F), the minimum temperature averages 10.2 °C (50.4 °F). During the colder days of winter, temperatures may reach a low of 6 °C (43 °F). All Israeli citizens over the age of 18 with at least one year of residence in Tel Aviv are eligible to vote in municipal elections. The municipality is responsible for social services, community programs, public infrastructure, urban planning, tourism and other local affairs. The Tel Aviv City Hall is located at Rabin Square. Ron Huldai has been mayor of Tel Aviv since 1998. Huldai was reelected for a fourth term in the 2013 municipal elections, defeating Nitzan Horowitz who ran at the head of the Meretz list. The longest serving mayor was Shlomo Lahat, who was in office for 19 years. The shortest serving was David Bloch, in office for two years, 1925–27. Tel Aviv is known to be a stronghold for the left. This is especially true for the city's mostly affluent central and northern neighborhoods, though not the case for its working-class southeastern neighborhoods. Outside the kibbutzim, Meretz receives more votes in Tel Aviv than in any other city in Israel. In 2006, 51,359 children attended school in Tel Aviv, of whom 8,977 were in municipal kindergartens, 23,573 in municipal elementary schools, and 18,809 in high schools. Sixty-four percent of students in the city are entitled to matriculation, more than 5 percent higher than the national average. About 4,000 children are in first grade at schools in the city, and population growth is expected to raise this number to 6,000 by 2012. As a result, 20 additional kindergarten classes were opened in 2008–09 in the city. A new elementary school is planned north of Sde Dov as well as a new high school in northern Tel Aviv. Tel Aviv University, the largest university in Israel, is known internationally for its physics, computer science, chemistry and linguistics departments. Together with Bar-Ilan University in neighboring Ramat Gan, the student population numbers over 50,000, including a sizeable international community. Its campus is located in the neighborhood of Ramat Aviv. Tel Aviv also has several colleges. The Herzliya Hebrew Gymnasium moved from Jaffa to Tel Aviv in 1909. The school continues to operate, although it has moved to Jabotinsky Street. Other notable schools in Tel Aviv include Shevah Mofet, the second Hebrew school in the city, Ironi Alef High School for Arts and Alliance. Tel Aviv has a population of 426,138 spread over a land area of 52,000 dunams (52.0 km2) (20 mi²), yielding a population density of 7,606 people per square km (19,699 per square mile). According to the Israel Central Bureau of Statistics (CBS), as of 2009 Tel Aviv's population is growing at an annual rate of 0.5 percent. Jews of all backgrounds form 91.8 percent of the population, Muslims and Arab Christians make up 4.2 percent, and the remainder belong to other groups (including various Christian and Asian communities). As Tel Aviv is a multicultural city, many languages are spoken in addition to Hebrew. According to some estimates, about 50,000 unregistered Asian foreign workers live in the city. Compared with Westernised cities, crime in Tel Aviv is relatively low. Tel Aviv's population reached a peak in the early 1960s at around 390,000, falling to 317,000 in the late 1980s as high property prices forced families out and deterred young couples from moving in. Since the mass immigration from the former Soviet Union in the 1990s, population has steadily grown. Today, the city's population is young and growing. In 2006, 22,000 people moved to the city, while only 18,500 left, and many of the new families had young children. The population is expected to reach 450,000 by 2025; meanwhile, the average age of residents fell from 35.8 in 1983 to 34 in 2008. The population over age 65 stands at 14.6 percent compared with 19% in 1983. Tel Aviv is an ethnically diverse city. The Jewish population, which forms the majority group in Tel Aviv consists of immigrants from all parts of the world and their descendants, including Ashkenazi Jews from Europe, North America, South America, Australia and South Africa, as well as Sephardic and Mizrahi Jews from Southern Europe, North Africa, India, Central Asia, West Asia, and the Arabian Peninsula. There are also a sizable number of Ethiopian Jews and their descendants living in Tel Aviv. In addition to Muslim and Arab Christian minorities in the city, several hundred Armenian Christians who reside in the city are concentrated mainly in Jaffa and some Christians from the former Soviet Union who immigrated to Israel with Jewish spouses and relatives. In recent years, Tel Aviv has received many non-Jewish migrants from Asia and Africa, students, foreign workers (documented and undocumented) and refugees. There are many refugees from African countries located in the southern part of the city. In 2008, the Globalization and World Cities Study Group and Network (GaWC) at Loughborough University reissued an inventory of world cities based on their level of advanced producer services. Tel Aviv was ranked as a beta+ world city. Tel Aviv is a major center of culture and entertainment. Eighteen of Israel's 35 major centers for the performing arts are located in the city, including five of the country's nine large theatres, where 55% of all performances in the country and 75 percent of all attendance occurs. The Tel Aviv Performing Arts Center is home of the Israeli Opera, where Plácido Domingo was house tenor between 1962 and 1965, and the Cameri Theatre. With 2,482 seats, the Tel Aviv Culture Palace is the city's largest theatre and home to the Israel Philharmonic Orchestra. The city often hosts global musical acts such as Paul McCartney, Madonna and The Rolling Stones in venues such as Hayarkon Park, the Israel Trade Fairs & Convention Center, the Barby Club and the Zappa Club. Opera and classical music performances are held daily in Tel Aviv, with many of the world's leading classical conductors and soloists performing on Tel Aviv stages over the years. Tel Aviv attracts over a million international visitors annually. In 2010, Knight Frank's world city survey ranked it 34th globally. 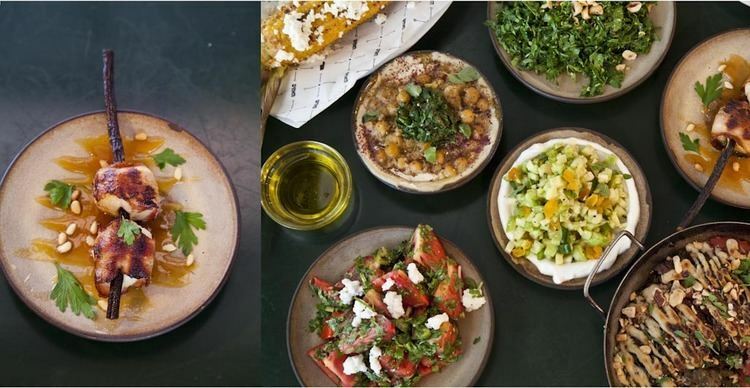 Tel Aviv has been named the third "hottest city for 2011" (behind only New York City and Tangier) by Lonely Planet, third-best in the Middle East and Africa by Travel + Leisure magazine (behind only Cape Town and Jerusalem), and the ninth-best beach city in the world by National Geographic. Tel Aviv is consistently ranked as one of the top LGBT destinations in the world. The Tel Aviv Central railway station is the main railway station of the city, and the busiest station in Israel. The city has three additional railway stations along the Ayalon Highway: Tel Aviv University, HaShalom (adjacent to Azrieli Center) and HaHagana (near the Tel Aviv Central Bus Station), Tel Aviv Mercaz. It is estimated that over a million passengers travel by rail to Tel Aviv monthly. The trains do not run on Saturday and holidays. The main highway leading to the city is the Ayalon Highway (Highway 20), which runs along the eastern side of the city from north to south along the Ayalon River riverbed, dividing for the most part Tel Aviv and Ramat Gan. Driving south on the Ayalon gives access to Highway 1, leading to Ben Gurion International Airport and Jerusalem. Within the city, main routes include Kaplan Street, Allenby Street, Ibn Gabirol Street, Dizengoff Street, Rothschild Boulevard, and in Jaffa the main route is Jerusalem Boulevard. Namir Road connects the city to Highway 2, Israel's main north–south highway, and Begin/Jabotinsky Road, which provides access from the east through Ramat Gan, Bnei Brak and Petah Tikva. Tel Aviv, accommodating about 500,000 commuter cars daily, suffers from increasing congestion. In 2007, the Sadan Report recommended the introduction of a congestion charge similar to that of London in Tel Aviv as well as other Israeli cities. Under this plan, road users traveling into the city would pay a fixed fee. The main airport serving Greater Tel Aviv is Ben Gurion Airport. Located in the neighboring city of Lod, it is a main international airport handling over 14 million passengers in 2013. The airport serves both international flights and domestic flights, and is the main hub of El Al, Arkia, Israir Airlines and Sun D'Or. The airport is 15 kilometres (9 mi) southeast of Tel Aviv, on Highway 1 between Tel Aviv and Jerusalem. Another airport in the Tel Aviv area, Sde Dov (IATA: SDV), in northwestern Tel Aviv close to Tel Aviv Port, serves mainly domestic flights and may be closed in favor of real-estate development. In the future all services to Sde Dov will be transferred to Ben Gurion Airport. The Tel Aviv municipality is currently working on building a SkyTran system across the city, under which light, two-person cars will be transported along elevated magnetic levitation tracks. Initially, a SkyTran loop will be built around the campus of Israel Aerospace Industries, followed by a commercial network around the city. This will be the pilot project of the SkyTran system, which is planning other such projects around the world.